Powers/Abilities: Ultra level: strength, invulnerability, speed, and senses. Able to fly. Fluoroscopic vision. Strength Level: Possibly the most powerful of all Big Bang characters. He doesn’t have his Earth-A’s weakness to magic or the need to recharge his powers. Affiliations: Knights of Justice in the 1940s thru 60s. National Guardians in the 1980s & 90s. History: Chris Kelly was a 4F reject driving home from his draft board, whose car was hit by a glowing meteor, charging him up with atomic power. He became as strong as an ox, as fast as a racing car, had skin like steel and could jump the length of a football field. His abilities grew more powerful. Soon he was flying instead of leaping. His senses were sensational: he could see long distances, and through or around almost anything. His hearing and sense of smell were fantastically advanced, and he could even hold his breath for hours underwater and eventually in outer space. This Ultiman was actually something of a bully, using force to show people the error of their ways. One of his favorite tricks in the early days was to drop someone off of a skyscraper, jump off and harass them on the way down, only to catch them before they hit the ground. He did mellow a bit. The Man of the Future became something of a benevolent “big brother’ to Empire City. 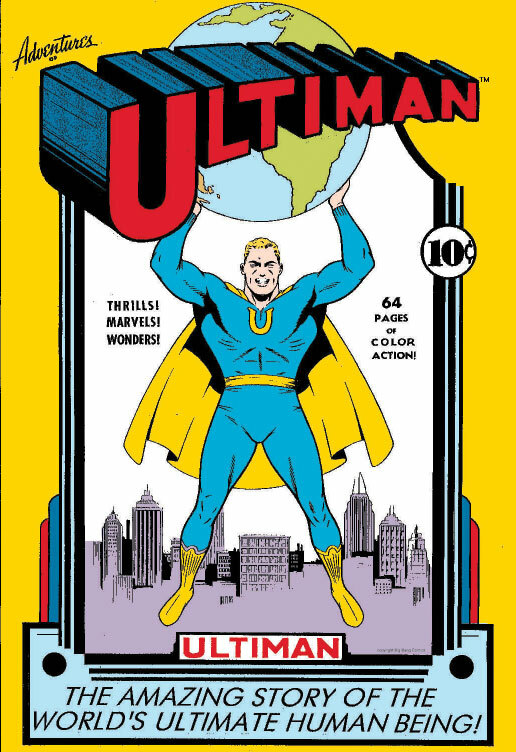 He established an office in the penthouse of the Empire City Building where he watched over the city for signs of trouble, using a myriad of telescopes and listening to a police band radio in the earliest days, eventually hiring a secretary, Lori Lake (Ultiman’s Girl Friday). People could actually come and ask for help, just like applying for a loan at the bank. Lori soon fell in love with her boss and plotted to somehow make him feel the same way about her. Instead of two-bit thugs and social problems, the Ultimate Human Being soon found himself facing more powerful adversaries: Cortex, the human brain. Bombshell, the femme fatale with exploding lipstick and a penchant for blowing things up. Mr. Mixitup, visitor from another world who looked something like Charlie McCarthy and caused his victims to suffer from delusional dementia. The Time Pirates. Ultiman eventually married Lori Lake, and settled down to domestic tranquility and bliss – until Lori died giving birth to their super powered baby. He is a bitter older man, his powers continuing to grow over the years.